I don’t know about you, but I love a bit of Nando’s. It was an old favourite from the UK so when Nando’s finally came to Abu Dhabi earlier this year, I was pretty excited. And I don’t know if you’ve noticed, but the UAE is also a nation of chicken lovers… just take a look at the queues outside any chicken establishment on a weekend if you want proof. So when Nando’s announced they were launching their delivery service in Abu Dhabi earlier on this month it was yet again another cause for excitement. 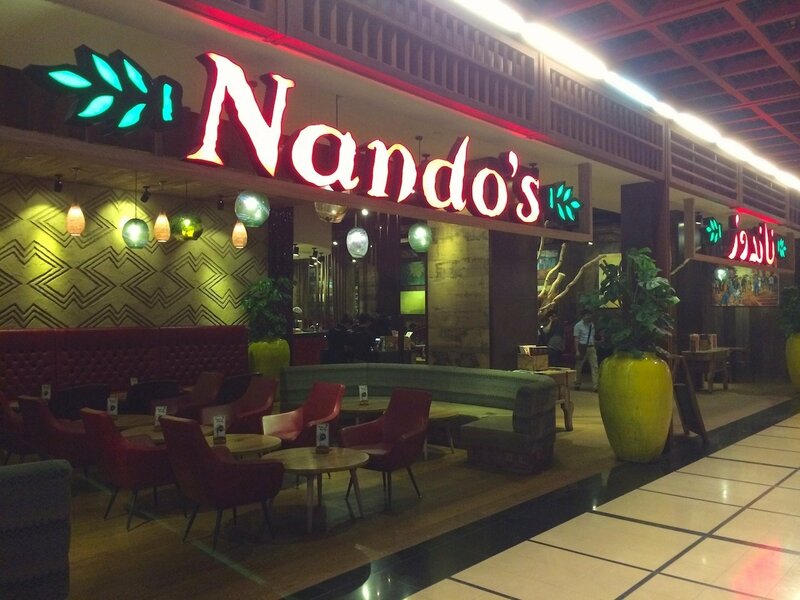 Yes, that’s right folks, Nando’s now delivers in Abu Dhabi! At this stage the service extends across the areas surrounding the World Trade Center and Al Raha Beach including Airport Road, Khalifa street, Hamdan street, Reem Island, Al Raha Gardens, Etihad Plaza and Al Reef. And for those of us who live in other areas, like the Grand Mosque district, hopefully we won’t have to wait too long until the service extends further (hint, hint. Pleeeeeeease take note Nando’s!). With that said, after all this talk of Nando’s I was in the mood for some chicken and just had to pay a visit, so off we bobbed (it’s a chicken joke – geddit? Chickens bob their heads when they walk!) to their restaurant at the World Trade Center. I feel like you always know what you’re going to get with Nando’s. Chicken. Grilled chicken. Well, yes, obviously… but you can pretty much also always be assured that you’re going to get some good, reliable, and indeed very tasty grilled chicken. They also actually have a good range of veggie things on the menu for those that don’t eat meat so no one need feel excluded from the fun. But it’s not just any old grilled chicken, oh no. Nando’s are experts at producing flame grilled, juicy chickens of perfection… and that’s before you’ve even thought about the sauce. I mean, there’s heaps of places that serve chicken, but Nando’s is different. What makes Nando’s unique (apart from their consistently juicy chicken and all round yumminess) is their choice of sauces – for those that don’t know, Nando’s is famous for their Peri-Peri sauce which comes in various different heats to suit all different tastes. You can choose from the safe bet – the lemon and herb (actually my favourite! ), mild, hot or for the brave and super spice loving ones out there – extra hot. 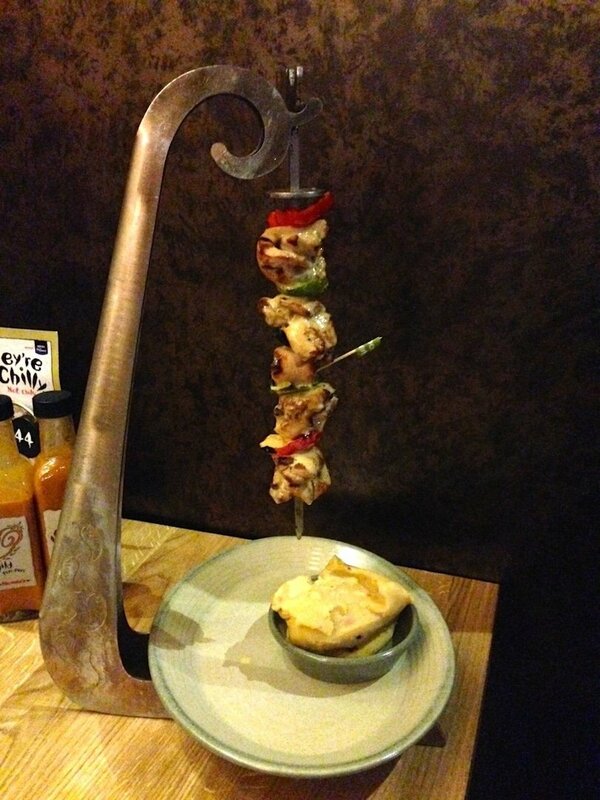 If you’ve not visited a Nando’s before, you may be wondering what all the fuss is about. Grilled chicken with sauce? Whoop-de-doo. Well, it may sound a bit boring, but honestly, boring it is not. There’s a range of chicken in all manner you can imagine for you to taste, from wings, burgers, pitas, wraps, half chickens, whole chickens, salads, not to mention their specialty – the Espetada. My personal favourite is the chicken in pita, which comes with salad and you can customise it with a range of extras – I like to add pineapple and cheese! And of course there’s also a range of sides to choose from. As you can see from the picture above, I plumped for the wedges and corn on the cob. 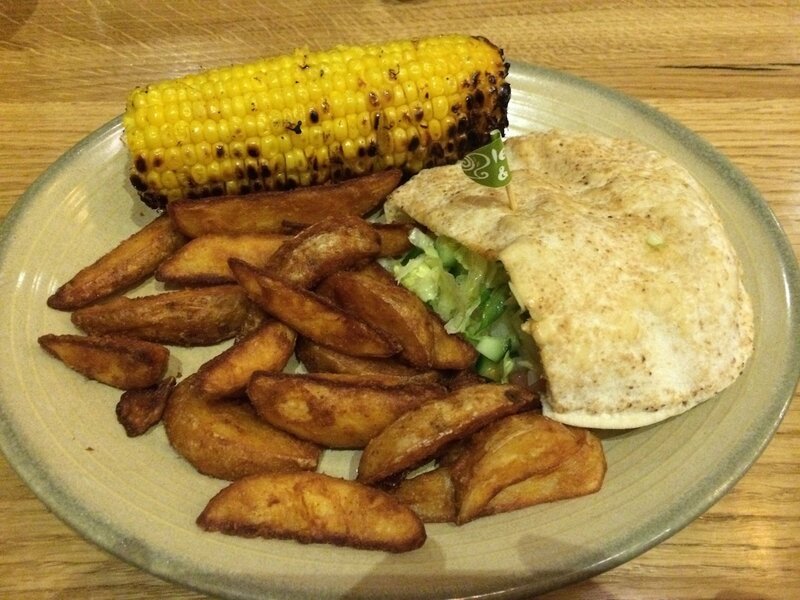 I’ve always loved a good corn on the cob, but again, there’s something about the way Nando’s do theirs… it’s got a cheeky little tang to it that I can never work out quite how they do it, and it’s also whopped on the grill for a little extra texture and flavouring just before serving. Mr. Arabian Notes decided to try the house specialty – the aforementioned Espetada… as you can see from the above picture, it’s quite a spectacle! Amazingly tender chicken thighs on a skewer with fresh peppers, served piping hot and tantalisingly dripping with whatever choice of peri-peri sauce you choose. If your mouth wasn’t already watering, I promise you it certainly will be at the sight of one of those succulent sticks of loveliness. 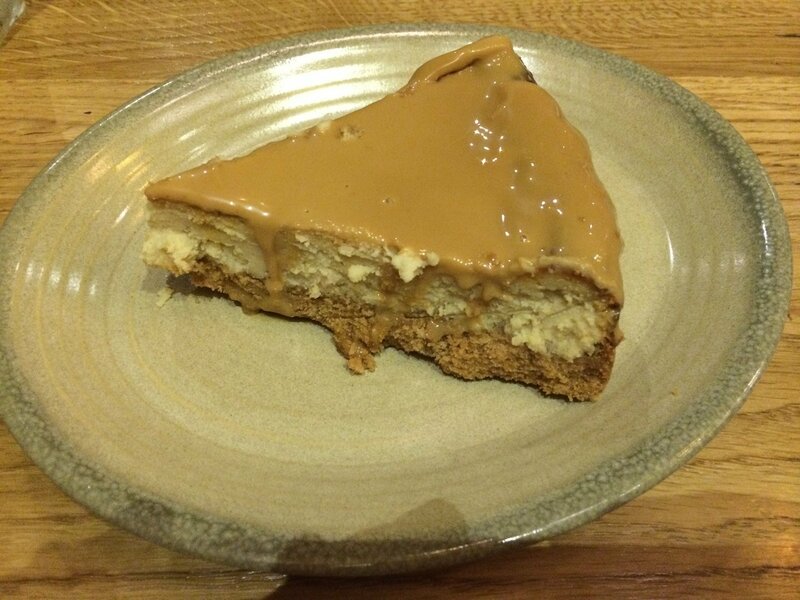 Finally, I’ve never had a dessert in Nando’s before but decided on this occasion to give their Caramel Cheesecake a road test. As you can see, it looked pretty good and was certainly a very generous serving! It had a great caramel flavour and the cheesecake itself was nice and firm, and I’m also pleased to report that it came with a real biscuit base! As I’ve mentioned in previous posts – this, in my experience is a rare treat to find in the UAE! Overall, Nando’s is a good, reliable place to eat where you know you’ll find some very tasty chicken (and vegetarian) options. It’s a family friendly, quick and casual dining experience that is always busting at the seams on the weekend, filled with those other chicken lovers in the UAE I was talking about earlier. What can I say? The people of the UAE love their chicken… and with Nando’s around, there’s no surprise why. You can currently taste the succulent scrumptiousness at World Trade Center Mall or Al Zeina and find out more online at www.nandos.ae.